Artisan, hand made hot chocolates using real chocolate shavings and the finest Belgian cocoa. Mix with hot milk. Each tube contains 200g of Hot Chocolate. Ingredients: Cocoa powder 51%, chocolate shavings 29% (sugar, cocoa mass. cocoa butter, whole milk powder, skimmed milk powder. emulsifier soya lecithin, natural vanilla flavouring), sugar. Ingredients: Sugar, cocoa powder 32%. chocolate shavings 18% (sugar, cocoa mass. cocoa butter, whole milk powder, skimmed milk powder. emulsifier soya lecithin, natural vanilla flavouring). Ingredients: White chocolate shavings 48% (sugar, whole milk powder, cocoa butter. emulsifier soya lecithin, natural vanilla flavouring), sugar, cocoa butter powder. Glucose syrup solids, cream powder. Guar gum. xanthan gum, carageenan E451. flavouring, whey powder, salt, milk protein. Allergy Advice: Contains lactose and soya. Main contain traces of nuts. 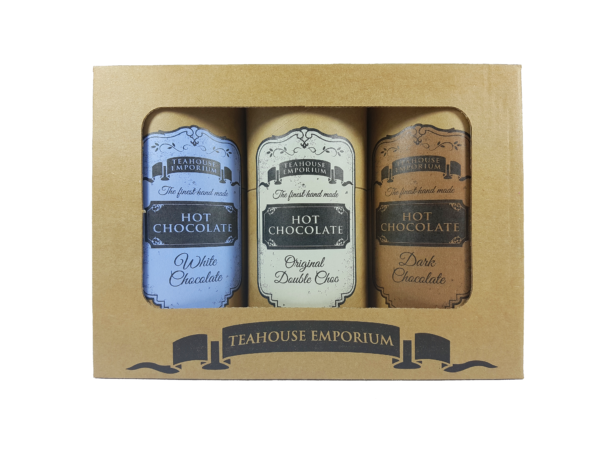 Find our full Hot Chocolate selection here!